With my summer holiday now behind me, I can start to accept that winter is definitely here. As the trees shed their leaves and the rain batters the windows, all I want to do is curl up on the couch with a steaming bowl of homemade soup. This quick and easy soup can be made from scratch and be ready to serve in just 30 minutes. Heat a little olive oil in a saucepan before adding the chopped onions to the pan. 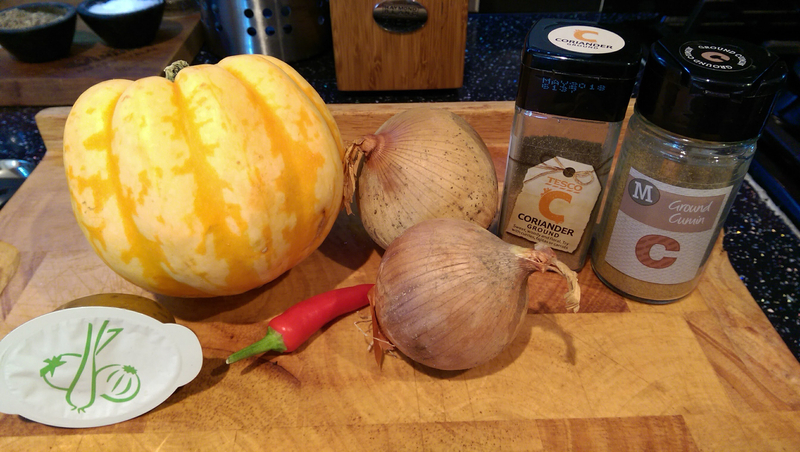 Cook the onions until soft then add the chilli and chopped squash. Cook for a few minutes until the squash starts to brown then add the ground coriander and cumin, cooking for a a further couple of minutes but be careful not to burn the spices. Add the stock to the pan and bring to the boil then reduce the heat and simmer for 20 minutes or until the squash pieces is tender. Remove from the heat then blitz with a hand blender, taking care not to splash hot soup everywhere. To serve, divide between two bowls then scatter with the chopped coriander and perhaps a swirl of coconut milk before serving chunky slices of buttered bread. This soup is so easy to make and tastes delicious. The spices do a great job of cutting through the sweetness from the squash. 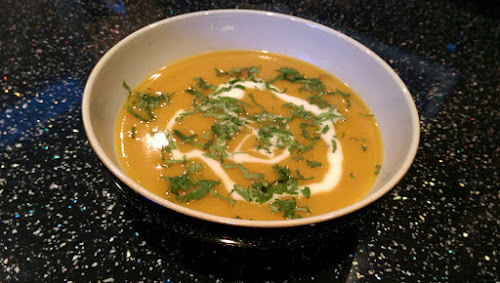 If you fancy your soup with more of a kick, simply ramp up the amount of chilli and spice in the recipe.